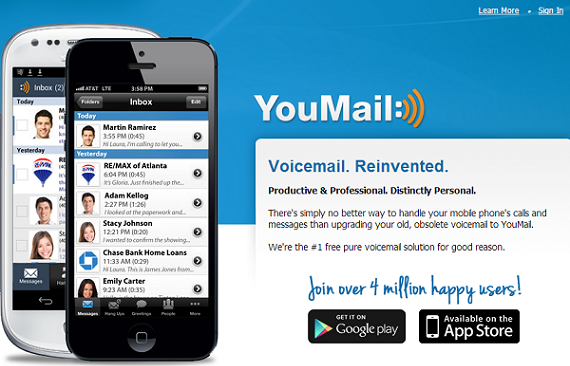 In an effort to become the premium voicemail service in the enterprise space, YouMail has debuted the Business Edition of its popular app. Smart Business Greetings, which takes YouMail’s “smart greeting,” which greets callers by name and makes it so that, in the Business version, it will include the user’s full name, company, and other optional information, such as e-mail address. An Enhanced Mailbox, which gives the Business inbox virtually unlimited storage, and makes it effortless to combine, organize, and manage voicemail from both the office and cell phone in one place. Voicemail to Email, which allows Business users to have their voicemail sent to email, along with wav or mp3 attachments, in a format of their choosing. They can also choose to automatically send carbon copies of important voicemail to colleagues or assistants to handle for them. The business service is also advertising free and includes accessible professional support, including a permanent access number that can be given out directly to clients and customers if desired. The reason that YouMail decided to launch a business edition of its app is simple: it is because these were not features that the regular YouMail user would need, YouMail CEO Alex Quilici said in an interview. "The typical user typically does not need to copy their voicemails to multiple people, or to put a company name in their voicemail. Putting those features into the regular service would not have been good for the typical user." The business model for the product is based on Dropbox, Quilici said, in that it is a service for the consumer that has been brought into the workplace. Once employees of a company like the service, YouMail can employ the Yammer model, and work directly with management to bring them a good rate on bringing the service to the entire workforce. In addition to its new business product, YouMail has also announced that it has over four million registered users. In addition, YouMail has registered users from over 150,000 different businesses and enterprises, working in over 15,000 different occupations, and with up to multiple thousands of YouMail users active within a single enterprise. Founded in 2007, Irvine, California-based YouMail is a mobile voicemail app that seeks to make the experience better for the caller with features that include personal greetings, which address the caller by name; and automatic texts that explain why the person did not answer the call. On the receiver side, it allows users to block people in a feature called "Ditchmail." Users can even submit which numbers are from telemarketers, so the service will block that number from calling any of its other users in the future. Focusing on the caller side of the experience is that separates YouMail for any other voicemail service, says Quilici, including Google Voice, though its biggest competitor is "inertia," or the resistance to change. The way that YouMail has gotten people to adopt it is by word of mouth; the company has done no marketing. It simply offered a better product than the standard voicemail that came with mobile devices. The philosophy of the company is to answer every call that a company misses, Quilici said, and to make it more comfortable for users to not have to always answer the phone. The company has raised $13 million, and has been funded by Vantage Point Capital Partners, the Crunch Fund, Siemer ventures, and the Tech Coast Angels. You Choose How To Pick Up Your Messages. Online voicemail saves time - go right to the voicemail you care about. Point, click and play. And online voicemail simplifies your life - easily delete messages that don't matter. Save using the phone for when you're on the go or not near a computer.